Reserve your spot now at the World’s Largest Yard Sale on June 17th from 8 a.m.-3 p.m. If you have stuff to sell … or want to get rid of things around the house…maybe you’re a crafter or own a home-based or small retail business and you’d like to make some extra money. 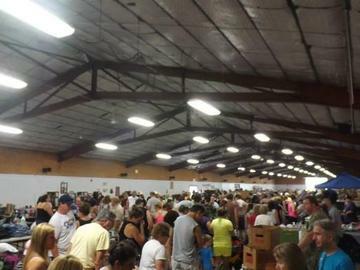 The World’s Largest Yard Sale is the place to do it. Last year's event brought over 170 vendors and more than 5,000 shoppers! The World’s Largest Yard Sale is promoted on Big Frog 104, Lite 98.7, 96.1 The Eagle and WIBX950am, with On-Air & Online Streaming Commercials/Website/Facebook, Fairgrounds Website, Fliers, TV & Print Advertising! INDOOR: Book a prime indoor space! Each Space is 10’x10’ and comes with ONE 8’ Table. INSIDE is nice so you don’t have to worry about the weather, AND load-in is the day before Friday-June 16th from 2-6pm, with more time to set-up. Spots are pre-assigned. Actual space shown on set-up day. PAVILION: Outdoors under the pavilion. Each Space is 10x10 and comes with one 8' table. Load in is on Saturday, June 17th from 5:30 - 7:30 am. Actual space shown on set-up day. OUTDOORS: 10’x20’ Space Outside on the fairgrounds. One vehicle can be left at vendor space.This space Load-in is on Saturday, June 16th 5:30 - 7:30AM. Outdoors regardless of weather. Tables not included. Actual space shown on set-up day. For Major Companies, Large Retail, Food & Beverage Vendors: CALL 315-272-2803. You CANNOT use this form to participate. Participation must also be pre-approved by the Fairgrounds & Townsquare Media. If booking more than 1-space, choose the approprate number in the dropdown in your category for your total. Additional Tables are available to rent at $10 Each. You may bring additional tables/display racks/etc. of your own. We highly recommend a 10x10' tent both inside and outside to clearly define your selling area. • No spaces reserved without payment. If you stop into our offices, we accept check, money order, Visa/MC/AMEX/Discover and cash. All reservations must be made in ADVANCE! NO REFUNDS. NO SPACES rented Day of Event. Agreement is Non-Cancellable. Once payment is processed, confirmation letter + set-up will be sent back. NO FOOD or Beverages can be sold at a Booth without prior approval by Townsquare Live Events. Contact us at 315-768-9500 directly. To Participate, reserve your space now or Download HERE & Return w/Payment. •	Agreement is Non-Cancellable. Once payment is processed, confirmation letter + set-up will be sent back. •	What CANNOT be sold: NO Tobacco, Firearms, Weapons, Alcohol, Offensive, Suggestive or Provocative Items.